Tenacity® herbicide is a systemic herbicide for pre- and post-emergence control of grass and broadleaf weeds in several cool- and warm-season turf species. The active ingredient, mesotrione, is based on a naturally occurring compound produced by the bottlebrush plant (Callistemon citrinus). Tenacity is a HPPD (p-hydroxyphenylpyruvate-dioxygenase) inhibitor that prevents the formation of carotenoids in susceptible plant species. Without carotenoids, light energy and by-products of photosynthesis destroy chlorophyll and cell membranes, resulting in bleaching of leaves and plant death. Certain grasses like bentgrass (Agrostis spp. ), nimblewill (Muhlenbergia spp.) and windmillgrass (Chloris spp.) are sensitive to Tenacity. Multiple applications can selectively remove these grasses from Kentucky bluegrass, tall fescue and perennial ryegrass. Coupled with a re-seeding program, turf areas can be converted to the desirable turf species. It is recommended to apply Tenacity at 4-5 oz./A on a two- to three-week interval for three applications. Seeding can occur after the second application of Tenacity. 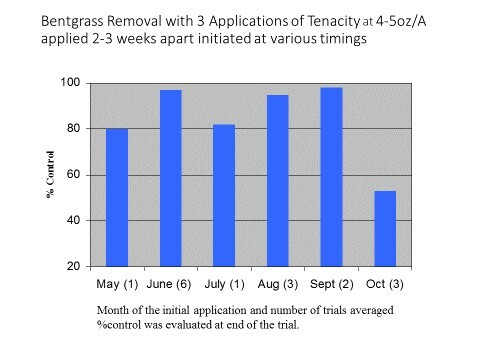 Depending on location, applications of Tenacity starting in August or early September will best coincide with a re-seeding program for optimum turf conversion. Below is a summary of Tenacity trials from across the U.S. over a number of years. For more information about bentgrass control, contact your local Syngenta territory manager or download the GreenCast® Turf App for both Apple® and Android® smartphones and tablets. ©2018 Syngenta. Important: Always read and follow label instructions. Some products may not be registered for sale or use in all states or counties and/or may have state-specific use requirements. Please check with your local extension service to ensure registration and proper use. GreenCast®, Tenacity® and the Syngenta logo are trademarks of a Syngenta Group Company. Apple® is a trademark of Apple Inc. Android® is a trademark of Google Inc.